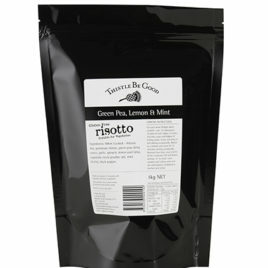 Our complete risotto mixes contain real parmesan cheese and are delicious and so easy as a main meal. Choose from Wild Mushroom & Tarragon, Rustic Vegetable with Rosemary or Green Pea, Lemon & Mint. Feel free to add your own goodies, such as pancetta, baby spinach or roast veggies – really tasty. 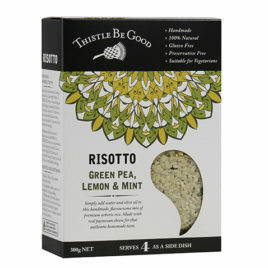 ...delicious classic risotto blend, clean, fresh and delicious. ...delicious classic risotto blend, clean and fresh. A classic risotto recipe; it’s been so popular for so long. As well as the obvious ingredients, it contains garlic, toasted onion and parmesan – so delicious! I love this with pan fried garlic prawns…. Mmmm…… doesn’t that sound good…..? ...the perfect balance of earthy flavours. 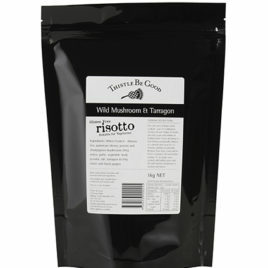 This is our biggest selling Risotto and is my favourite one too. It has champignons (button mushrooms) and porcini mushrooms – a beautiful combination. I can eat a big bowl of this on its own or I also love it with some chorizo mixed through – very simple but oh so tasty.